If you see animals, you’re a rock star! My Latest creation is a triple abstract painting made of acrylic, some trimmings, marker and nail polish. This is what I call mix technique! I really like this work because even though it meant to be an abstract painting, those with developed imagination started seeing animals. I’m super curious on what people can see here, everybody creates different paintings depending on what their minds and eyes combine. It’s like playing with the clouds! Can you see them? if so, please comment below what you’ve found. Note: No animals or monsters have been intentionally painted on this canvas. Once upon a time, when studying at university, I had an assignment for Product Design where the idea was to redesign a bird. A very interesting and entertaining homework because it allowed me to play a lot with all the characteristics of the birds, an animal that I really like. Among all the characteristics I redesigned, one was their feet. I changed their feet so they can wear cool sneakers. Almost 7 years later my dream came true and I am painting those birds wearing Vans, Dr Martens and Converse. I hope you like them! A collage is a piece of art made by sticking various different materials such as photographs, postcards and pieces of paper or fabric onto a backing. I combine in my collages images that once have called my attention and have entered into my “Collection Envelope” till I find the perfect canvas to paste them. I love dropping some acrylic stains to integrate and balance the whole piece. Here is my Collage Gallery from the last year. Traveling to work is one of the most boring moments of the day for many people. Passengers generally use this dead time for reading the news or private messages on the phone. For me, traveling by train in the morning was one of the best 30 minutes of the day. I enjoyed observing the people. Their behavior, their faces, their clothes, their gestures. Everything. The line San Martin has the most interesting and various travelers. And every stop brings new faces and stories. 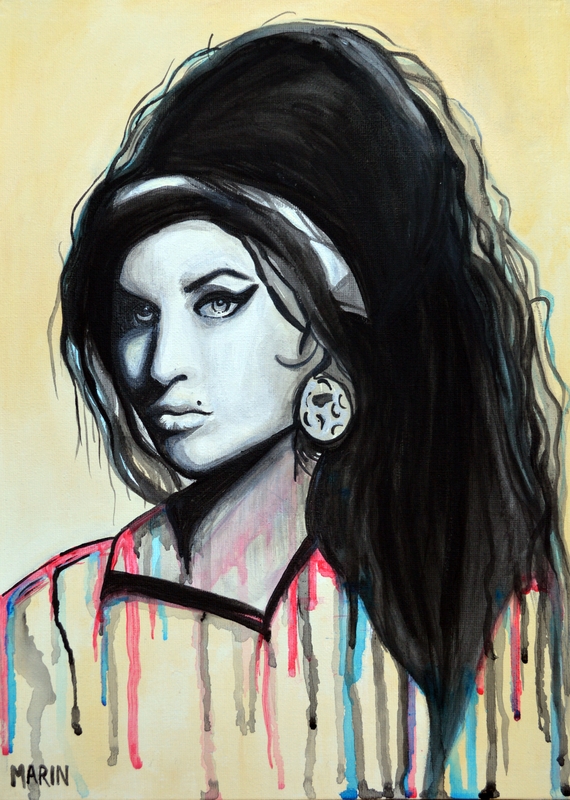 This is my version of #Amy #Winehouse, a true legend whose music and personality have influenced and touched so many. Did you know that The Rolling Stone is also a great Artistic Painter? Ronnie Wood was born in Middlesex, England, into a musical and artistic family. Before beginning his musical career and achieving worldwide renowned with the Faces and the Rolling Stones, he received formal art training at Ealing College of Art, London. He grew up surrounded by his two later passions – music and art, something that has stayed with him during his life as a rock and roll icon. 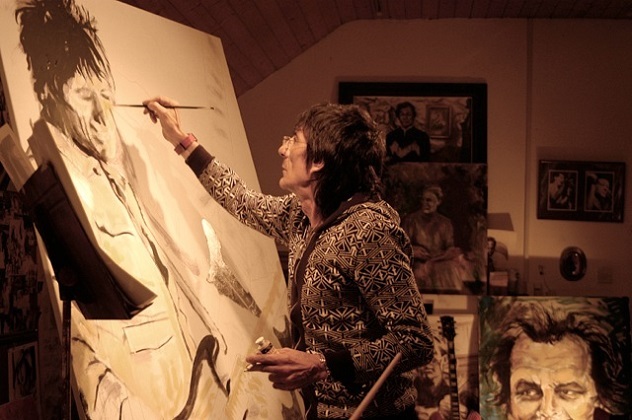 As his musical career has progresses Ronnie Wood has continued his passion for painting and drawing. His subjects range from immediate colleagues in the rock and roll band, to other famous rock and roll musicians he has admired, known and has sometimes played with. Family, friends, animals and of course the self-portraits perhaps show a more private side. On Tuesday 4th February, Castle Fine Art, Bruton Street, will be launching the ‘Ronnie Invites…’ series, which will see various artists, invited by rock legend Ronnie Wood, to display their work over the course of 2014. (http://www.ronniewood.com/News/ronnieinvites) I will be there!!! Brett Amory is an american artist. 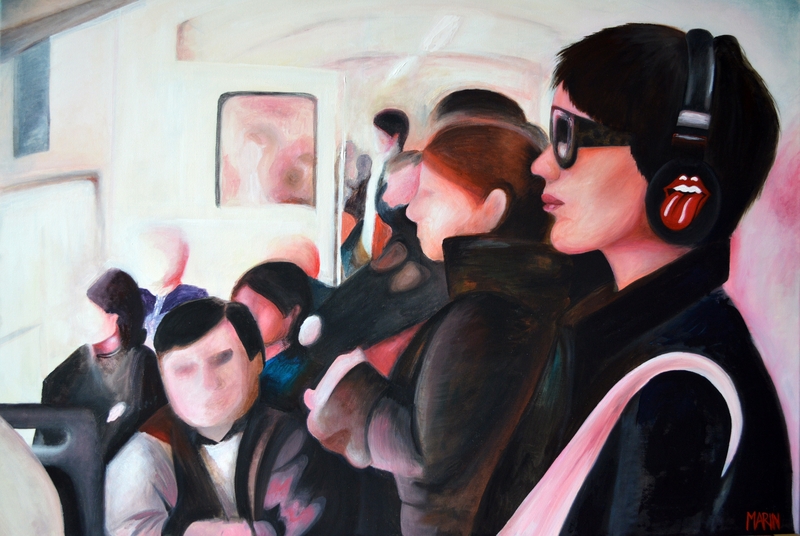 He began the Waiting series in 2001 with paintings depicting commuter subjects seemingly detached from their fellow passengers and surrounding environments, inspired by the introverted culture of public transit and inhabitants of the Tenderloin neighborhood of San Francisco (where the artist lived for fifthteen years). Figures and places in Amory’s work are based on photographs the artist has taken of ordinary city architecture and random people who he sees on a daily basis but never speaks to. He feels especially drawn to individuals who look lost, lonely or awkward—those who don’t appear to fit in socially. In the past year he’s had solo shows in Los Angeles, San Francisco, London, New York and San Jose. If you want to know more about this great artist, you should visit his website! Ray Charles (September 23, 1930 – June 10, 2004) was an American singer-songwriter, musician and composer. He was a pioneer in the genre of soul music during the 1950s by fusing rhythm and blues, gospel, and blues styles into his early recordings. Frank Sinatra called Charles “the only true genius in show business”. Although his difficult life, Ray always had THE BRIGHTEST SMILE. I think this great musician deserves a portrait, and here is my version! BTW, the movie “Ray” is strongly recommended! It’s the story of the life and career of the legendary musician. Pop Geometry refers to Burgess’s love of Pop Art and the incorporation of found vintage ephemera into his collage, much of it referencing a golden age of American graphic design and advertising. The geometric elements, and the use of text and typeface also reference early Twentieth century modern movements such as Supermatism and Constructivsm, and a time of extrodrinary creativity in Russian and European art. By combining geometric form with American graphics, Burgess constructs a playfull meeting of two distinct artistic cultures, East and West, old and new. I discovered him first because of his amazing Collages. My favorites are the cities! Born in London and living in Arizona, Burgess travels the world for inspiration. But then I realized that he is also very good at painting! He is very versatile, going from the abstract to the very detailed painting. Look at these cars! !